Just like fine aged wine, our Vintage Oak Wine Barrel Round Bar Stools with leather seats will stand the test of time. Wine Barrel Round Stool is topped off with a comfy brown leather seat which adds to is rustic appeal and natural beauty. what are the dimensions at the bottom of the stool (where it meets the floor)? BEST ANSWER: The "greatest dimension" on the floor measures 15 ½ inches on a side - it is a square. Measuring from the center of the bottom of each leg gives you more like 15 inches on a side. About 19 1/2 inches from leg to leg (opposite legs). The leather is a little more orange than brown. Photo doesn't show true color. More like a Longhorn burnt orange color. The dimensions.....where the legs meet the floor.....is nineteen inches. As you can see from the picture the legs flair out past that point to a total of twenty inches. Because of the taper of the leg an exact measure is difficult. Less than 15". The dimensions.....where the legs meet the floor.....is nineteen inches. The legs of the stool are 13' apart at the bottom. What is the height from the floor to the footrest? BEST ANSWER: The footrest of the Vintage Oak Wine Barrel Round Bar Stool with Leather Seat is 5 1/2 inches from the ground. 6'' from the floor to the footrest. Great stools, sturdy, I have 2 teenagers and we sit at them everyday. From the floor to the bottom of the footrest 5 3/4" and to the top of the footrest just shy of 6 1/4"
My footrest measures 6 inches from the floor. Mine are 6 inches from the floor. Can you put a pad on the bottom so our hard wood floors are not scratched? BEST ANSWER: As you may see in the pic - the bottom of leg is more of an edge so I would think it would be difficult for an adhesive felt pad to stay put. Give a small strip of felt a try maybe and see? I was a finish carpenter/cabinet maker and I would recommend these stools as well made/sturdy/nicely proportioned. I cut the narrow strips from this package (home depot Everbilt-Assorted-Heavy-Duty-Self-Adhesive-Felt-Pads) into smaller narrow pieces to fit the legs and it seems to work well. You may want to scrape the legs with sandpaper a bit to make them stick better. You could use the felt stick-on "cut to fit" type. Not sure how well it would stick to the wood and may need to be replaced occasionally. I was able to get pads to affix to the bottom. The surface was clean and easy to work with. Check the "home" stores there are several solutions to put pads on these if needed. What is the distance between two legs as they meet the floor? Diameter at top is 14 1/2 inches. Is diameter where legs meet the floor more? Please advise. Thank you. BEST ANSWER: I am measuring the diagonal distance between 2 legs at 18 inches on the inside of the legs. If you measure the distance between legs that are side by side it is approximately 14 1/2 in. The Vintage Oak Wine Barrel Round Bar Stool with Leather Seat has a base diameter of 19 1/2 inches and the distance between legs is 12 inches. Does this stool come in a 30 inch? I haven't seen the the narrow profile any taller. The rest of the range is taller and has a wider footprint (the stages how out). I must say the product is excellent quality and I'm very happy with my purchase. They don't . I wanted the 30 inch too. However I went with these and am very happy. Excellent quality and they look great. do these have a swivel top? Thanks! BEST ANSWER: No, the bar stools do not have a swivel top. The vintage oak stool does not swivel. What color is the leather on these stools? Do they come in brown or other? The color they come in is brown. BEST ANSWER: The weight limit on this is 250 lbs. Is this stool available as bar height (28-30 in) rather than counter height? Currently, it is only available with a 24" height. can you get these stools 30" tall for a real bar ? BEST ANSWER: Unfortunately this item is only available in the 25" height. We do carry other bar stools such as the Howard Miller Item # 325 57 31 at 30" height. Can you purchase these stools unfinished? I would like to get them stained to match my cabinets and table stain. BEST ANSWER: The stools can be purchased unfinished but would also require assembly as well. For this special order or for more details on assembly please call us at 1-800-356-8466. Do the seats on these stools swivel. BEST ANSWER: Thank you for your question. The seats do not swivel. Please let us know of any other questions. We can be reached at 1-800-356-8466.
is this also available in 30" or 32" height? BEST ANSWER: Unfortunately, that is the only height that stool is available in. What's the weight of the heaviest person who could sit in these without breaking the swivel? Very comfy bar stools ! Use the stools in the kitchen, and at a small bar in the kitchen.[...] No assembly required - that was great! The only problem is the seats are two different colors - but that worked well with our colors, and they are not sitting right next to each other so it is okay. Great stool! Very well made and very comfortable. Getting lots of complements! Quality leather seat wood and hardware. Wish I needed more! This is a comfortable, stylish bar stool that works well with a counter-height island. It took about 3 weeks to arrive, as the web site stated. 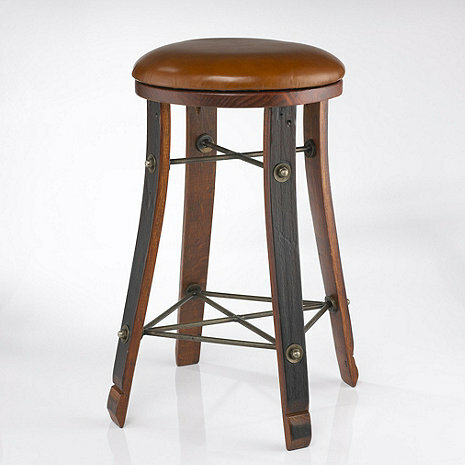 Since all bar stools tend to come loose over time, this style is nice because the screws can be tightened periodically on the outside of the legs. The stool seems very sturdy and fits our rustic setting well. The barstools I purchased are slightly different than the one pictured. The legs bow out and look more like a wine barrel. The stools are comfortable and are medium weight so they slide in and out from under my kitchen island with ease. They came assembled and ready to use. The Wine Enthusiast had them for the best price. Sturdy and durable shipping container. Arrived without any damage. They took about three weeks to ship and were packaged very well. They arrived in good condition. Perfection at it's best. These are sturdy and cute, with the inverted design they work perfect for small areas. I am so happy I decided to purchase these stools. They are a beautiful design and confortable. I spend more time sitting in the kitchen now then ever before. My only regret is that I didn't purchase them sooner. perfect fit for our wine room! they are a perfect fit in height and color for our new wine room. This fits very nicely with our kitchen decor. The stool is well made and priced below what others are asking. I would recommend this and am very glad we ordered them. CON: Too short for the bar, this is a GREAT size for extra seating at the poker table! Several years ago my husband and I bought a high top wine barrel table with wine staves for legs just like these stools. We have used the table as an accent table however when I saw these stools my hope was that they would be the right height to be used with the table. Amazingly they look like they were made to be an original set. Now we have a little mini bar table. They shipped assembled... even better. The only problem was the wait to get them......2 months! Delivery time is long, but worth the wait. The stools are perfect for the area I have them in. I love the rustic, but classy look they have. They are so much more comfortable than the wood stools I replaced. They are made simply, but well as you can tighten the legs if needed. I am so glad that I found these stools. I would absolutely recommend and may purchase other wine barrel furniture in the future. These stools were exactly what we were hoping they would be. Cool and compact, fit where they were intended to fit. We purchased one of these bar stools about four years ago. Liked it so well when we needed two more we couldn’t find anything that compared to the barrel-stave version for our cottage. Excellent !! These stools are gorgeous! Worth the money....the leather is soft and a lovely warm caramel colour....quality is superb. Would definitely purchase them again. Leather is more orange than brown. Love this piece, but the leather is pretty orange, not brown as shown. I might have to recover. These barstools are exactly what I wanted. They come assembled and seem to be of good quality. The leather is very nice and the seat is comfortable. The only reason I didnâ? ?t give it a 5 star, is because in the photo the legs look like a dark brown. They must have come from a red wine barrel. Great stools, but leather could be better. Took almost 6 weeks to receive. I love the style of the stools, but the leather tops are way more ORANGE then they look in the picture and not shiny or slick like the picture looks. The leather is very soft (reminds me more of suede) and not distressed, so I'm not sure how well they will clean up from marks and spills. Also, in some areas the cushions don't go all the way to the edge of the stools, so the leather is pulled tight against the wood tops. In those areas the leather is already worn, which makes me question the quality of the leather. I'm keeping the chairs because I love the style. But I I may have the tops recovered at some point. I am very pleased with my wine barrel bar stools. I ordered 6 and they are very sturdy and the craftsmanship is consistent. I would have liked to see this style offered with a back on it. I only held out on 5 stars to see how they hold up with long term use. I would purchase this product again if I needed more. Overall, I'm very pleased with this counter stool. I do wish the seat swiveled and that the color of the seat was more honey brown than orange. These arrived in perfect condition and are very comfortable. I have barrel staves as my flooring in my cellar and there match extremely well. It took a while to get the bar stools but when they arrived we were not disappointed. The product arrived in great condition. I was nervous since it shipped UPS and everything I have received in the past that shipped UPS was either broken or damaged. When they shipped these stools they had stickers on the boxes telling you not to use a razor blade when opening. Thank you for the warning since the leather seat was not protected and you would have cut right through it when opening the box.